Helmets may not have been popular back in the day because they were mostly clumsy and silly-looking. They had a negative aspect given to them. In fact, they were usually thought to be for extremely cautionary or nerdy users only. Today, this is no longer the case. We can now find the most stylish of helmets that offer unbeatable protection against accidents and head traumas. Riding with a helmet is always your safest bet. Along with it being legally required in several places, there is really no reason not to use one anymore. 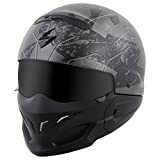 Keep your head intact without losing any stylish flare by purchasing one of the following badass helmets, which we have carefully searched for you. This lightweight helmet comes at a decent price, with four different colors to choose from: white, black, matte black and matte green. Designed to turn heads, this Shark RAW Blank Helmet is perfect for cruising and offers complete comfort. Shark are a top French based helmet brand with 30 years experience designing badass motorbike helmets. It is built as an open helmet with a mask, so protection may be a bit limited. However, it will do for ordinary bike riding through town. It offers a quick pull-release function for faster removal as well. The specific design gives you versatility to use it as an open helmet or a masked open helmet. It all depends on climate conditions and destination. The super-cool style will bring out a few compliments from people as well. Meet a helmet that is ahead of its time! Designed to disperse impact and minimize weight, this ScorpionExo model will keep your head safely in place. The simple yet amazingly fabulous style will please any fellow rider and non-rider. The black matte finish means women and men can easily pair it with any type of bike. It features a retractable sun visor too, which helps reduce eye strain in various lighting conditions. Experience protection with style thanks to its industry-leading polycarbonate shell. From the same maker comes the Ratnik helmet, which is similar to the one listed above. However, it has a Phantom design which brings even more attention. Experience the same great quality helmet with a more unique design and color variation. Similarly, this helmet is also perfect for both women and men. Use the helmet in a variety of ways, such as ¾ or complete. Protect your head with the advanced engineered shell and get other features such as comfort and perfect fit. You are sure to stand out when wearing this! OPTICALLY CORRECT DROP DOWN SUNSHIELD - Protect your eyes from sun, bugs, and debris while enjoying the sights with the easy to use, optically correct, drop down inner sun shield on the Warrior half face helmet. FEATURE-LOADED - The Rebel Warrior skull cap helmet features a NEW size-adjustment dial system for the perfect custom fit for your head, an advanced moisture wicking liner, channeled EPS for increased cooling & safety, and padded quick-release strap. 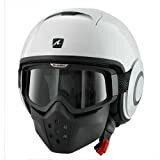 SAFE - Meets or exceeds US DOT FMVSS 218 safety regulations and is engineered with a thick, high density fully vented EPS liner to greatly absorb impact so you can feel confident riding your cruiser, chopper, scooter, moped, ATV, UTV or street bike. Vega Helmets has been a trusted company since 1994, offering quality helmets at a reasonable price. This particular half helmet is wonderful to have, especially given the variety of colors and styles you can purchase. Loaded with features and extras, the Vega Helmets for both men and women will leave you with your mouth open in surprise. This small and lightweight product definitely packs a punch and can be trusted to offer protection. It includes a quick-release strap and allows for a cool, comfortable fit all day long. Enjoy your ride without worrying about eye strain or damage from flying insects, sun rays, or debris. Also get the perfect fit using a specially-designed dial system instead of Velcro. The number one reason any motorcyclist should use a helmet is for their own personal safety. Helmets offer a barrier against any possible object that can incur damage on the brain, which is a very sensitive and vital organ. Brain damage can result in numerous conditions, since it is the powerhouse of the body. Chances of survival during a bike accident are greatly reduced if the person has suffered any kind of head trauma. The only way to minimize damage to your head is by using a helmet. Helmets have been known to save lives and are a vital part of riding safety – no matter the distance or the speed by which you travel. Another reason is for convenience and comfort. Helmets come in all shapes and sizes. This means you are bound to find one that complements your personality and makes you look good in the process. It is also a comfortable item to have along when traveling at fast speeds to protect your eyes from flying insects and debris. Having the added protection against the harmful sun is also a plus. Most helmets come with a certain degree of sun protection for better visual quality and clarity, which is also a matter of safety. Not all areas legally require riders to use a helmet. However, it is best not to pick a fight with the law and wear one just in case. Helmets are ideal in almost every situation and you can always look for one that is comfortable for you to wear on a daily basis. At the same time, it should offer you a certain degree of protection for those “just-in-case” moments. Taking control of your safety, following the legal guidelines and practicing safe riding is all part of being a responsible motorcyclist and citizen. If you have ever examined your helmet, you may have found various stickers stuck to it somewhere. These stickers or codes determine the type of certifications it has received, if any, in regards to safety. Most countries use a mixture of ECE 22.05, DOT and AUS 1698-2006 codes. SNELL M2015 and SHARP are another two types of codes you may see, depending on the country of manufacture. Your helmet should have at least one certification to be considered reliable. Each type of certification comes with their own list of pros and cons, which can be found online in a blink of an eye. Another dire factor to consider for a true reliable helmet is how well it fits on your head. Helmets should never be loose, resulting in a worse scenario than not wearing one in the first place. On the other hand, helmets should not be too tight either. This is because they can restrict the circulation of blood, leaving you with a very painful headache and possible damage if worn for long periods of time. A reliable helmet fits you like a glove – not too tight and not too loose. If you are experiencing issues measuring your head or finding a helmet that is right for you, consider getting a custom-fit helmet from a professional source. A properly fitted helmet is a life-saving helmet. If your helmet is worn down, it is definitely no longer reliable and should be replaced. Maintaining your helmet in good condition requires cleaning with special polishes and wax instead of common detergent. You should never handle it by the chin bar, which only degrades the padding and damages the straps. You can also use a scarf or bandana to reduce sweat and bacteria accumulation in paddings. Purchase antibacterial sprays or wipes and use it every once in a while on the padding – just check for color fastness beforehand! Now that you know more about helmets and the important role they have in safety, there is no excuse to go without one. You can also browse the selection of badass helmets available which will keep you looking stylish while protecting you from incurring damage. Safety and the law are no joking matter and riders should do everything they can to be responsible citizens. Not only for their own safety, but that of others. Helmets are now so varied that you are sure to find the perfect badass design in no time.